A few passing clouds, otherwise generally clear. Slight chance of a rain shower. Low around 55F. Winds SSW at 10 to 15 mph. A research center in the middle of Africa studying mountain gorillas needed someone with journalistic experiences in writing and photography. Fremont resident Dean Jacobs needed another challenge and a way to use as many of the skills that he’s acquired over the years and over his travels. The 46-year-old Jacobs recently returned home from spending 7 1⁄2 months based in Rwanda working for the Dian Fossey Gorilla Fund International, documenting various activities in words and photographs. He said he got the job by chance. “In 2007, when I was on my trip around the world I met the vice president of the organization,” he said. Dr. Alecia Lilly was speaking where he was passing through. “She was talking about how Pfizer helped deworm a half-million people in Rwanda and the Congo. I thought that since I used to work for Pfizer, it would be a good story to try to sell them. That’s why I introduced myself. Plus, it gave him a chance to use his education, a bachelor’s degree in biology from Wayne State College. “It gave me a chance to get back to my roots of science and combine that with my love of exploring and traveling the world. It helped that I worked as a photographer at the Fremont Tribune for two years. It made me a better photographer,” he said. For the job in Rwanda, he said, it was more than just photographing and documenting the work done with gorillas by DFGFI staff. It was also photographing and writing about the work staff did with the National University of Rwanda, the medical clinic, and the elementary school in the village of Bisate and the surrounding eco system. But the work that is most known for DFGFI staff is the work with mountain gorillas — which made Dian Fossey famous in the late 1960s and 1970s. 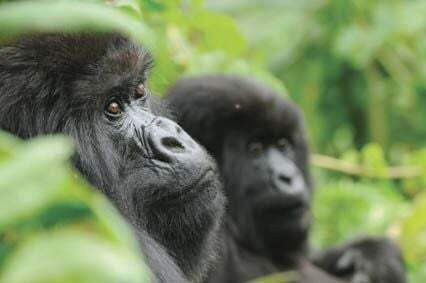 700 mountain gorillas in the world,” Jacobs said. “They’re all in the wild. They aren’t in any zoos. They’re all in the Congo, Rwanda and Uganda. 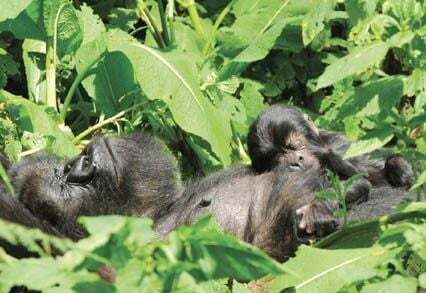 They started studying mountain gorillas because they’re part of the primate family. “It’s studying humanity from a scientific viewpoint. We, as humans, have so much in common with mountain gorillas. They’re trying to gain some insight on how man has developed over a period of time. How do societies develop over time? How do relationships develop? I saw those dynamics in those groups of mountain gorillas. Also, mountain gorillas will protect the members of their group from other groups of mountain gorillas and from other perceived dangers. “The thing that really drove it home for me was a day when I was up in a tree taking photos of the mountain gorillas. I always shoot with two cameras: One with a wide angle lens and one with a long lens,” he said. While shooting with one camera, the other is draped off of his shoulder. “There was a juvenile mountain gorilla looking up down by my feet,” he said. “I was ignoring him. I would move one way, and he would follow me, looking up. I would turn, and he would follow me. I finally realized what he was doing. He was following his own reflection in the camera (hanging down). They also share a sense of curiosity. But there’s more that humans share with mountain gorillas. “They live in a small and depleting habitat. If we can find a way to preserve their habitat and help them survive, then we can apply those lessons to humanity. We’re dealing with similar issues with a growing population and growing pressures on our own habitat. Mountain gorillas have a right to be here just as much as we do,” he said. Jacobs enjoyed several aspects of the job. “There wasn’t really a favorite part,” he said. “I enjoyed working with wonderful people — dedicated, smart, committed, funny, inspiring people. It was inspiring to talk with them. People who are there from the outside want to be there. They want to make a difference. Nothing there is easy, and there are lots of obstacles. Even though he enjoyed the experience, he’s happy to be back home. “I could tell I was getting tired and needed to decompress, but there’s a lot of things that I miss,” he said. “This trip was different than the others I’ve taken. Normally, I moved steady from one place to another, but this time I had a base and worked with people who shared a common goal. I miss the people I got to know, admire and respect. I miss going out in my backyard and looking over the horizon to see volcanic peaks. He doesn’t miss is the fact that there are people everywhere. In an area about one-seventh the size of Nebraska there are about 10 million people. What’s next now for Jacobs? He’s already scheduling presentations for elementary and middle schools in several states, but he’s also scheduling programs at regional universities. He already has presentations scheduled at the University of Iowa and Wayne State College with discussions being held for presentations at other colleges and universities. Many of his elementary school programs will continue to focus on his “follow your dreams” approach that led him to leave a job as western region sales manager for Pfizer and spend two years traveling around the world. But now, he is developing a second program based on his experiences spending time in the forests of Africa with mountain gorillas. But there could be more. There could be another trip to Africa in the future. Even before he left, discussions started with DFGFI staff to have him return to continue the work he started.